Bo and Sonny made it on this year’s card -But no Christ. 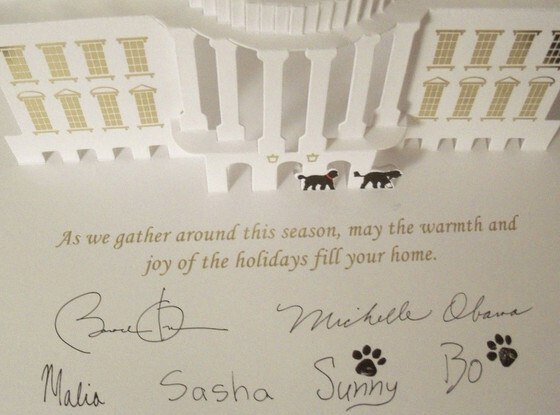 Barack Obama’s 2013 Christmas holiday card contains two dogs but no mention of Christ or Christmas. There’s been a fair amount written about the Obama Christmas card. It’s a pop-up card, which has an expensive look that’s unseemly as millions lose their insurance and millions more have joined the ranks of the perpetually unemployed. It’s colors are cool, not warm, which seems to refute the warmth that Christmas brings to people in the dark of winter. It shows a vacant building, which seems symbolic when one considers that Obama invariable answer to all the scandals revealed in the past year is to disclaim knowledge or responsibility. And lastly, despite going out at Christmas time and despite Obama’s claims to be a Christian, the card makes no mention of Christmas. Keep in mind with this last point that the card ostensibly comes not from “the government” but from a man and his family.